Would you like to branch out and try something new with your quilting in 2018? Enjoy the rhythmic practice of finishing your quilts by hand with the help of hand quilting stencils. Even if you’ve tried hand quilting before, each new quilt top is a blank canvas for a unique hand quilting pattern. TO HELP YOU ON YOUR WAY TO HAND QUILTED BLISS, HERE ARE A FEW IDEAS TO HELP YOU WHEN USING STENCILS. 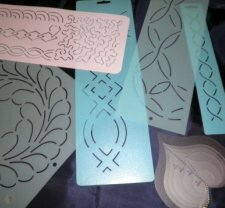 When you are shopping for hand quilting stencils, there are no real limitations. Most stencils are made of plastic for durability, and they will include a cutout that you can use to trace a design onto your quilt top. You can also choose to draw and cut out your own quilting stencils or sketch your design freehand onto the quilt top. However, shopping for ready-made designs can be a time-saver as well as a great source of inspiration for hand quilters. You can even trace some stencils designed for painting on the wall, repeating the motif along your quilt top. There are several methods for working with hand quilting stencils, but the basic idea is to temporarily transfer a design from the stencil to the quilt sandwich. Quilt marking techniques include sketching the design using fabric markers or pencils, applying quilter’s chalk or creasing the fabric with a hera marker. Marked quilt (pictured above) with a homemade hand quilting stencil created using Cricut die cutter and a Pilot FriXon fine-point pen. In case you were interested in the costs that go along with buying hand quilting supplies, Debby shares the breakdown purchases, including a quilting hoop, needles, thread and other supplies, on her blog Nanny’s Place. Once you’ve transferred your first hand quilting stencil to the quilt sandwich, you always have the option to continue the pattern around the quilt. But if you’d like to mix things up, you can also pair the first stencil with a different quilting design. In this example of a traditional Welsh quilt from blogger Marjorie of A Way of Seeing, you can see that the hand quilting patterns include spirals and clamshells in the background, as well as diamonds and straight lines within the colored shapes. When in doubt, you can always trace inside the perimeter of your pieced or appliquéd sections and fill in the center using a stencil. Hand quilting offers the perfect chance to customize a quilt with your favorite patterns. For instance, wouldn’t this Hand Quilted Kitty by Craftsy member tomib be the perfect complement to our favorite cat quilt patterns? The stitched feline is a student project made as part of the Craftsy course Hand Quilting: Heirloom Design & Technique with Andi Perejda, which covers everything you need to know to become a confident hand quilter. DO YOU HAVE ANY HAND QUILTING STENCILS IN YOUR COLLECTION? WHAT IS YOUR FAVORITE PATTERN TO STITCH BY HAND?